3. The evidence concerning the effects of smokeless tobacco use on the salivary’ glands is inconclusive. GUM RECESSION – Constant irritation to the spot in the mouth where a small wad of chewing tobacco is placed can result in permanent damage to periodontal tissue. It also can damage the supporting bone structure. The injured gums pull away from the teeth, exposing root surfaces and leaving teeth sensitive to heat and cold. Erosion of critical bone support leads to loosened teeth that can be permanently lost. INCREASED TOOTH DECAY – Sugar is added to smokeless tobacco during the curing and processing to improve its taste. The sugar reacts with bacteria found naturally in the mouth, causing an acid reaction, which leads to decay. TOOTH DISCOLORATION AND BAD BREATH – Common traits of long-term smokeless tobacco users are stained teeth and bad breath. Moreover, the habit of continually spitting can be both unsightly and offensive. NICOTINE DEPENDENCE – Nicotine blood levels achieved by smokeless tobacco use are similar to those from cigarette smoking. Nicotine addiction can lead to an artificially increased heart rate and blood pressure. In addition, it can constrict the blood vessels that are necessary to carry oxygen-rich blood throughout the body. Athletic performance and endurance levels are decreased by this reaction. ORAL CANCER – With the practice of “chewing” and “dipping,” tobacco and its irritating juices are left in contact with gums, cheeks and/or lips for prolonged periods of time. This can result in a condition called leukoplakia. Leukoplakia appears either as a smooth, white patch or as leathery-looking wrinkled skin. It results in cancer in 3 percent to 5 percent of all cases. 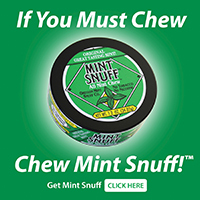 OTHER CANCERS – All forms of smokeless tobacco contain high concentrations of cancer-causing agents. These substances subject users to increased cancer risk not only of the oral cavity, but also the pharynx, larynx and esophagus.